The Croke Park pitch before the mens-ladies league double-header involving Dublin, Cork and Donegal. 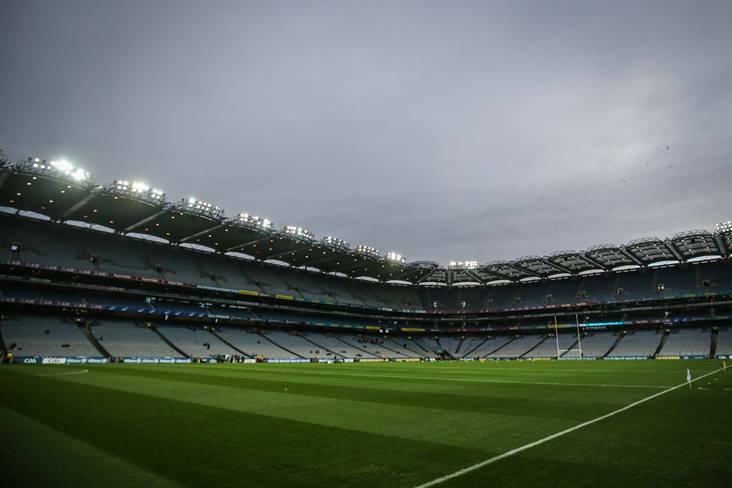 The GAA has re-fixed most of the hurling and football league games that were snowed off last weekend. The HL1 quarter-final between Wexford and Galway takes place at Wexford Park on Saturday at 3pm, while the Dublin V Tipperary quarter-final throws in at Croke Park on Sunday at 1pm, curtain-raiser to the Round Seven football league meeting of Dublin and Monaghan. The hurling league semi-finals were due to be played this weekend, but will now be staged on Saturday, March 31st. The final is therefore pushed back by a week for the second time, to Sunday, April 8th. However, no date has been found for the outstanding Division Two national football league games that fell foul to the weather over March Bank Holiday weekend, namely Down V Tipperary and Louth V Meath. This matter is complicated by the fact that Tipp are locked in a race for promotion with Cavan, whom they face in Round Seven this weekend, with the CCCC confirming that the last round will go ahead on Sunday afternoon as planned. The Division Four clashes of Laois and Antrim and Wicklow V Limerick are also in limbo (Leitrim have given London a walkover). The O'Moore County and the Saffrons are both still in contention for promotion. The four remaining outstanding fixtures have been pushed back to the weekend of March 31st / April 1st but will only be played then if they are needed to determine final berths. The Division One football league final between Dublin and Galway takes place on Sunday, April 1st at Croke Park. The Division Two final will precede it unless the top two have not been determined, in which case it moves to April 7th. The Division Three final (Armagh V Longford or Fermanagh) also goes ahead at HQ on Easter weekend - Saturday, March 31st. With Carlow safely through, the Division Four decider provisionally forms a double-header, unless the Laois V Antrim match is required to sort out the Barrowsiders' opponents, in which case it also gets pushed back to April 7th. The HL2A final between Carlow and Westmeath forms a double-header with the replayed All-Ireland Club SHC final between Cuala and Na Piarsaigh in O'Moore Park on Saturday. Cuala v Na Piarsaigh - Portlaoise, Saturday March 24th 5.30pm. If finalists are known after these fixtures, final to take place on Sunday April 1st in Croke Park with outstanding refixtures (i.e. Louth v Meath and Down v Tipperary) TBC. If finalists are not known, re-fixtures to take place on Easter weekend and league final on Saturday, April 7th. If finalists are not known, re-fixture of Laois v Antrim to take place on Easter weekend and league final on Saturday, April 7th. Note: Leitrim have conceded their outstanding Rd 5 game to London and London will be awarded the two points for this fixture.